If there’s one thing we know about Richmonders, it’s that they love their beer — and thanks to the Virginia Historical Society (VHS), they’re in for a treat. To kick off Virginia Craft Beer Month next month, the museum will host its first-annual “BrewHaHa” craft beer festival on Saturday, August 5 from 6-9pm. Some local names participating in the fest include Ardent Craft Ales, Three Notch’d Brewing Company, Trapezium Brewing Co., Center of the Universe Brewing Company, Alewerks Brewing Company, The Virginia Beer Company, Stone Brewing Richmond and Blue Bee Cider. At the festival, beer lovers can taste samples inspired by historical recipes (including a few from the VHS archives), in addition to their favorite selections from local breweries on tap. A pre-event VIP session at 4:30 will feature an exclusive tasting and discussion by Virginia beer historians and brewers. On tap, guests can enjoy historic samples and local beers accompanied by live bluegrass music, games and local concessions on the museum’s lawn. Each ticket comes with free admission to the VHS Toys of the ‘50s, ‘60s and ‘70s exhibit and a commemorative tasting cup. The VIP event will host Colonial Foodways historian Frank Clark with local beer historian and author Lee Graves, moderated by National Park Service ranger and historian Michael D. Gorman. Early Bird tickets can be purchased in advance for $18 before July 31. Adult admissions after July 31 will cost $24 per ticket, with non-taster tickets for $10 and free admission for children 18 or younger. All work and no play makes Richmond a dull city. From now until September 4, you can cut loose with Nerf balls, Hungry Hungry Hippos, and the pong at the Virginia Historical Society’s exhibit, “Toys of the ‘50s, ‘60s and ‘70s,” all while learning a thing or two about some of America’s most iconic eras along the way. “Toys” is a touring exhibit organized by the Minnesota History Center in St. Paul, Minnesota, and it displays some of the most influential toys of the 1950s, 60s and 70s. The exhibit opened at the VHS on February 24, setting the tone of fun for all ages when Richmond sculptor and founder of MCS Design and Production Inc., Allen Jessee, debuted the world’s largest Slinky. 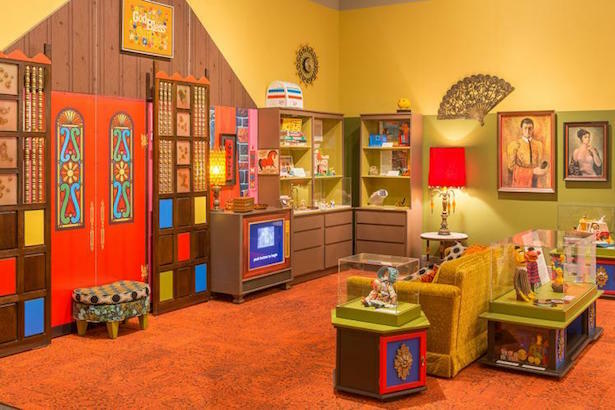 “Toys” is divided into three model living rooms designed to look like the playsets of each decade, complete with TVs that play 24/7 decade-appropriate toy advertisements. The entire exhibit has nearly 500 toys, games and decorative items in all, making it the largest exhibit to come to the VHS. Behind every toy, there is intention. Often, the toys were designed to allow children to understand the world they live in through play, and teaching them the principles of an era— principles that were almost always accompanied by colorful TV character counterparts. Toys like the Davy Crockett coonskin caps and baby dolls of the 1950s encouraged young boys to be brave and girls to become mothers, while the astronaut playsets and Barbie dolls of the 1960s encouraged an adventurous spirit in both boys and girls. The materials that the toys are made of change between each living room from wood to plastic to electronics, showing the technological advancements of each decade, while the trends in the toy advertisements show the evolution of kid-targeted programming. Along with toys relegated to a single decade, the exhibit also contains free-standing display cases for the toys that made multiple-decade impacts, from timeless building toys like Legos to a display case dedicated solely to toys so dangerous, they eventually led to the first toy safety council. If you’re worried that such a bright, fun-filled exhibit is too tempting to keep your hands off of, the exhibit is one step ahead of you. Once you’ve made your way through each living room, you’ll find an area full of toys and games that you are free to play with—but you may want to get there early. The exhibit will run until September 4, and admission to “Toys” is free for VHS members, $10 for nonmembers, $8 for groups of 10 or more. For more information on the VHS and the “Toys” exhibit, you can visit here. The Virginia Historical Society’s most recent addition entitled “Arming the Commonwealth” displayed a unique variety of weapons, munitions, and accessories manufactured and used in the state of Virginia during some of its most important and historical moments. Among the items in the collection of “The Story of Virginia” exhibit at the Virginia Historical Society, there’s a specific story of the relationship between the history of our state and the power that tobacco had in shaping the development of Virginia. As a part of its Created Equal Film Series in Honor of Grady W.